Ever since I learned about the Expo Line — and the path that trains used to travel a century ago — I’ve relished in stumbling across bits and pieces of the old infrastructure that still dot the Westside. The original tracks were built by a predecessor to the Southern Pacific Railroad in the late 1800s and then turned over to Pacific Electric for daily passenger service in 1911. The line closed to the public for good in the early 1950s, while freight service continued intermittently into the 1970s. To some the remaining infrastructure might just be pieces of rusty metal, but to me they are an interesting representation of our urban environment and history. So I grabbed my camera and hopped on my bike to document what was still left in the Phase II segment — focusing on the area between 17th Street in Santa Monica and the 10 Freeway. First, there’s the sense that what is old is new again. For several decades in the 20th Century, we seemed to collectively forget the benefits of mass transit in Los Angeles. But now, thanks in part to Measure R, we are seizing the opportunity to go back to those historic corridors and breath new life into them, transforming them back into the vital connective tissue they once were. Second, I enjoyed seeing how L.A. has grown up around the old rail corridor with little bits of track peeking through in random places such as parking lots and medians along the Exposition Boulevard right-of-way. And lastly, much of this infrastructure will be torn out and replaced by the new Expo Line, so this is my contribution to the historic record. For more information on the history of the Santa Monica Air Line, the website Abandoned Rails has a good introduction, as does the Electric Railway Historical Association. Check out the photos in the gallery below and the dozens more on the Metro Flickr page. 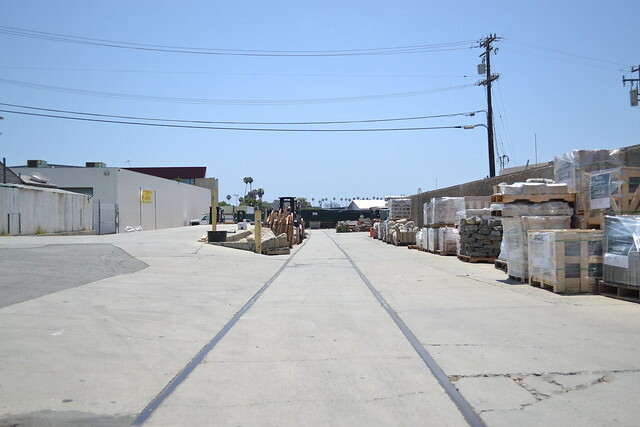 Actually, one weekly freight train operated on the Expo Line to Fisher Lumber in Santa Monica until 1987. What would LA be like if we still had the Pacific Electric. Such a sad sight. As part of the historic mitigation measures for EXPO Phase I we implemented “storytelling” pavers at each of the stations hopefully allowing some of the many unique and quirky memories of the airline to live on. Small typo (I think) to report: I don’t think it’s possible to be between 17th Street and the 10 Freeway, as they run perpendicular, not parallel. Perhaps you meant to reference the 405? There is a very good video I found on Youtube of a time-lapse tour of the Expo Line Phase II rigth of way, from Palms to Pico Blvd. here’s the link. The same user also have other interesting videos such as a Drive-by of the Expo Line Phase II construction, and a time lapse trip of the entire gold line, among others. Many are on the Metro Library site, too.